Conceived and developed in 2004, with Daniel Hirschmann and Jean-Marc Gauthier. Exhibited at Musée d’Art Moderne et d’Art Contemporain in Nice, France. 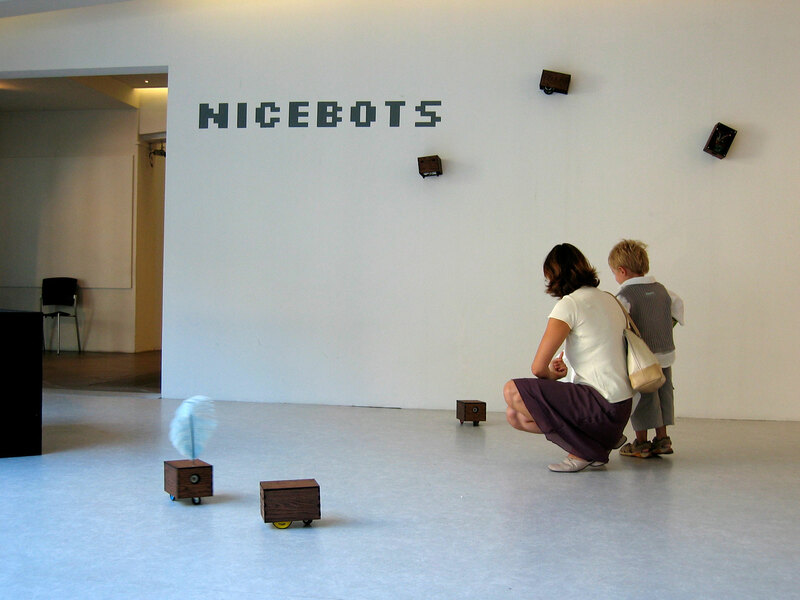 “Nicebots” is a one-month long open studio exhibit, showcasing the construction and design of interactive robots. During the exhibition, the artists transform the gallery space into a working studio where the audience is able to observe and learn how the bots are built and interact with them in their space. The open studio format allows for dynamic changes throughout the exhibition. By observing the audience’s interaction with the bots and the effects the bots have on the audience, we are able to make adjustments and “teach” the bots different behaviors. 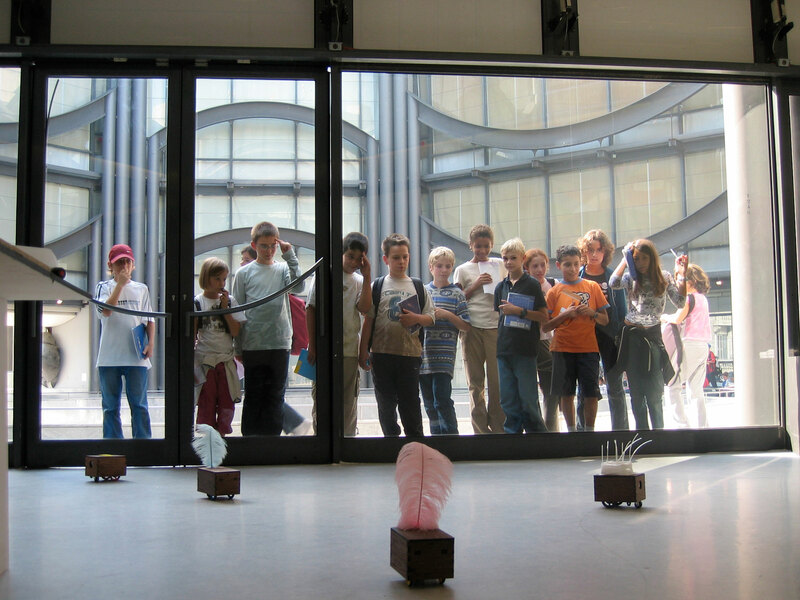 During the one month exhibition, the bots begin as infants, having only basic motor and sensor controls. As the show develops, additional bots will be built and their “brains” will evolve with our guidance. Unique behaviors will emerge giving each robot their personality. The “Nicebots” are electronic handicrafts, constructed almost entirely by hand using available hobby materials with the exception of circuit board fabrication and laser-cut wood pieces. Designed to be of the same species, each bot contains the same basic components that make up the body anatomy. The components fit together in a rectangular box that makes up the body of the bot. Each bot is programmed with the same sensor and motor controls, but slightly different logic to give the bot unique personality. The bots are completely autonomous and “grow” throughout the exhibition. Over time, we reprogrammed them to make wiser decisions when hitting a wall or trying to get out of a corner. The magnet sensor enable the bots to sense each other and interact with a “magic wand”—magnet on a stick held by the audience.